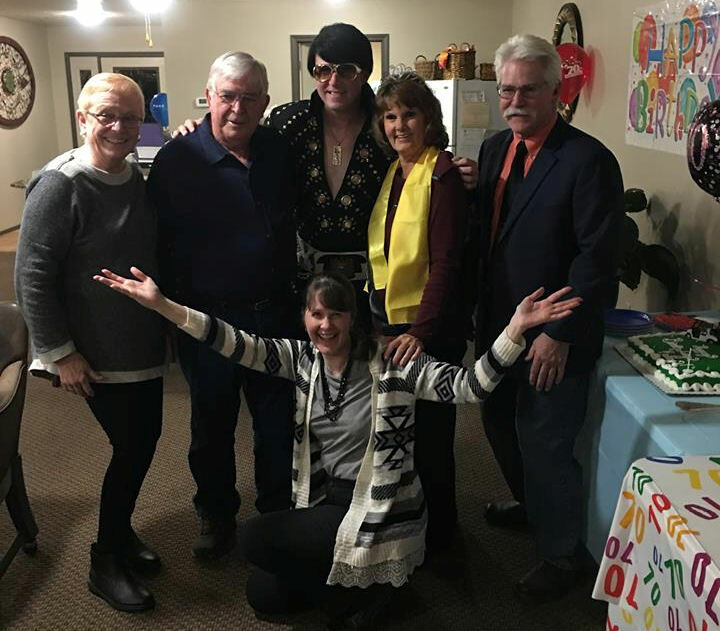 When talk was first brought up about a party for my Mom’s 70th birthday this past November, my first thought was: we have to get Elvis! 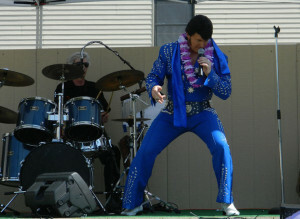 And in honor of Elvis’ birthday today, I wanted to share about the festivities. My Mom has been a fan of the King since she was a little girl – and even got to see him perform in concert in Wichita, Kansas eight months before he passed away. She also remembers being really worried in Junior High when she first heard about him going into the service. 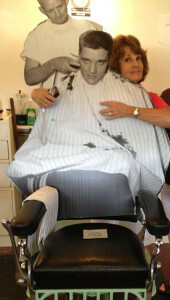 Because of that, she especially loved visiting the Fort Chaffee Barbershop Museum in Fort Smith, Arkansas a few years ago – in the building where Elvis received his first military haircut. 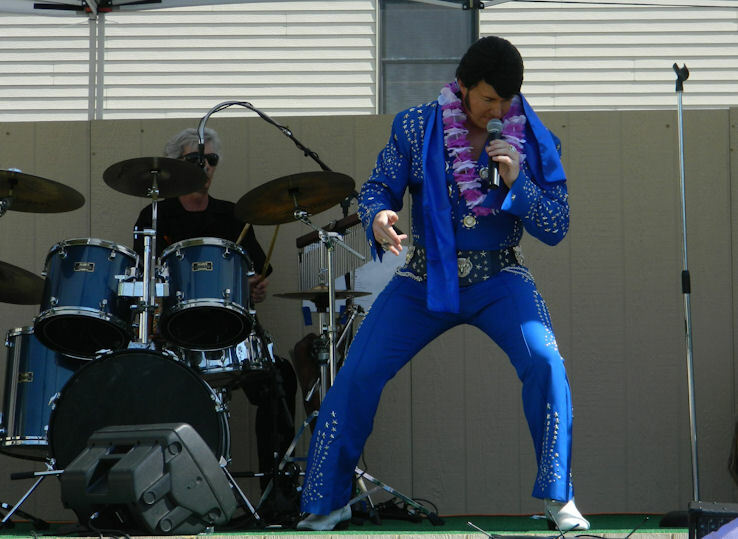 In 2014, while Mom was recuperating from a procedure, a friend and I went to the Elvis Haircut Festival being held at Fort Chaffee. 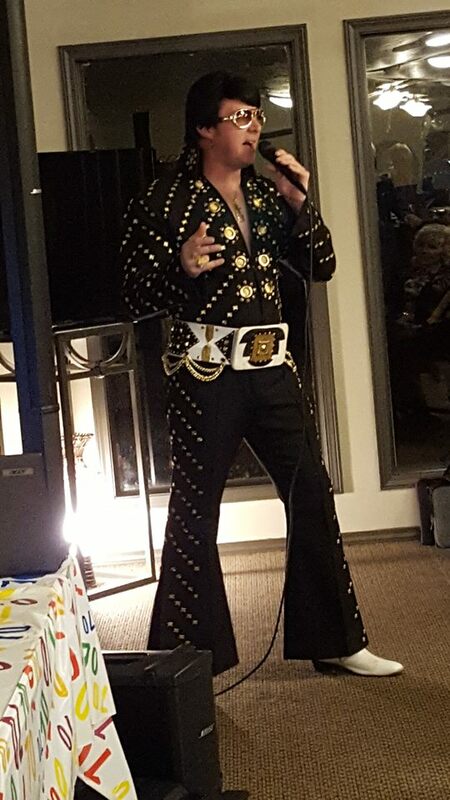 As I wrote at the time, part of the entertainment was an Elvis impersonator – or as he calls himself, “an Elvis tribute artist.” We honestly weren’t expecting too much but were blown away by the incredible voice of Brent Giddens. So much so that we instantly called my Mom and held the phone up so she could listen along. She was upset that she missed out on seeing such a talented performance, but made up for it by getting to see him in two other concerts the next year. 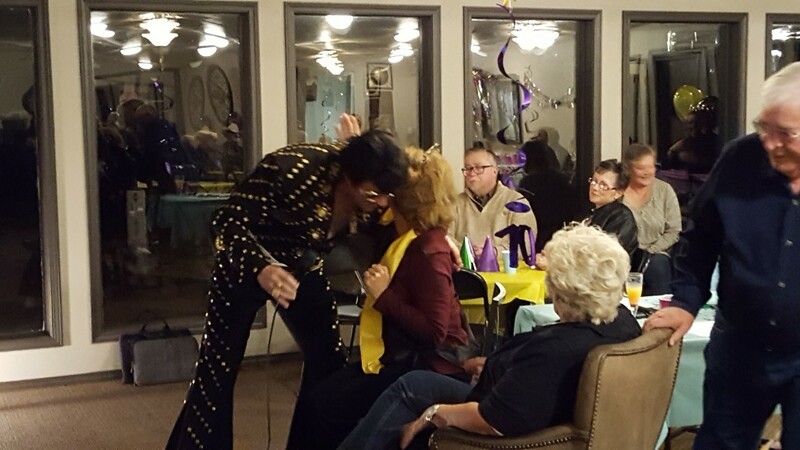 She never got to sit up close, but always enthused about how wonderful Mr Giddens is – and that he’s her second favorite Elvis after the original. That night, after sitting my Mom in front of her friends, my Dad took the stage for what Mom thought would be just a fun birthday slide show. 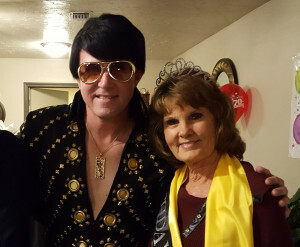 But when he said, “Let’s hear it for Elvis Tribute Artist Brent Giddens,” my Mom shouted “No way!” and then gasped as he came striding out in full costume to Elvis’ entrance music. As you can see from the following pics, she was thrilled! 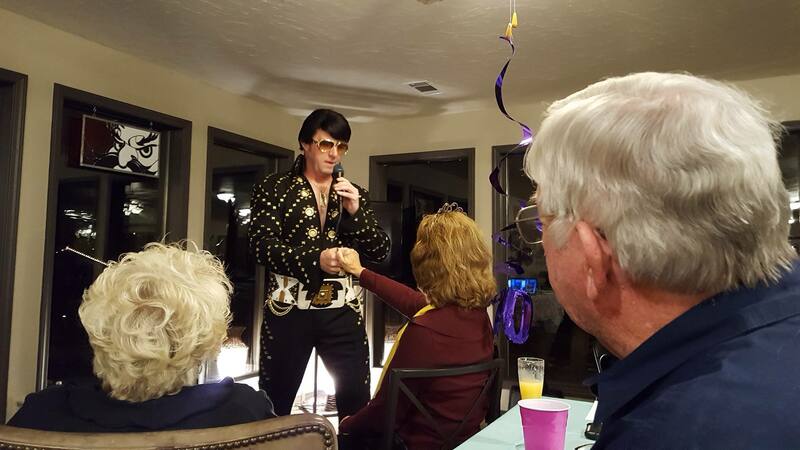 That’s my Dad looking on while “Elvis” holds my Mom’s hand. Hehe! He even sang Happy Birthday to her, which she said was one of her favorite parts. The crowd loved it (including my at-first-skeptical uncle). And although my Dad took the microphone at the end to say, “Elvis has left the building” he was actually gracious enough to stay for pictures with anyone who wanted one. And many did! Thank you so much to “Oklahoma Elvis” Brent Giddens! My Mom is still talking about the incredible surprise and that she finally got to sit up close for a performance — AND got a scarf from him. After the party, when I asked if she was happy, she said, “Of all the different Elvis impersonators I’ve ever seen, he’s by far the best. And of course I’m happy!” In other words, Operation Elvis Surprise was a rousing success. What a wonderful surprise. For a true blue Elvis fan, this was a dream come true. Brent is the closest thing I’ve ever heard for sounding just like the real Elvis. 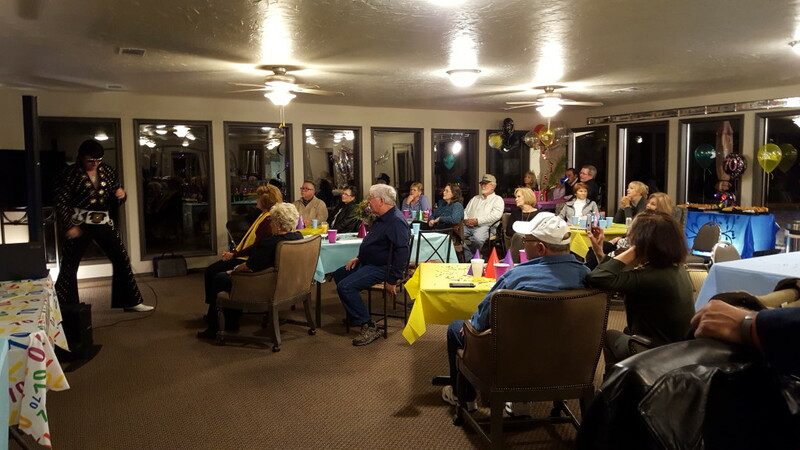 This was a fantastic 70th Birthday for Kathy. Glad that I was part of the planning. 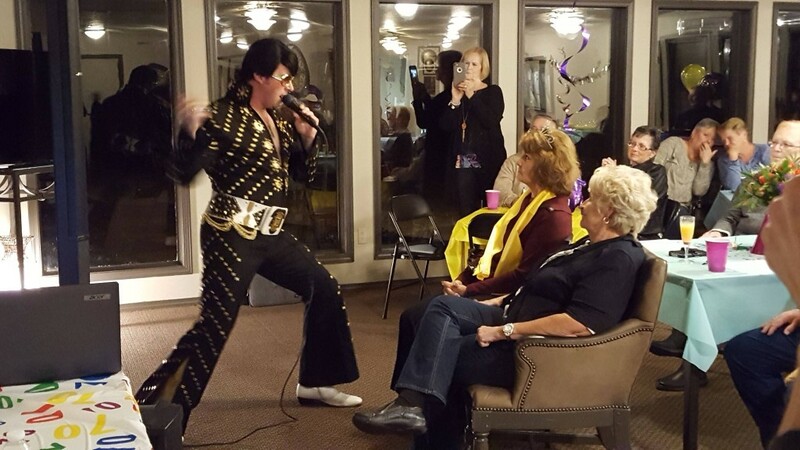 Deborah and I knew that Kathy would love Elvis. A year of planing went into this day. Glad it was a great evening. Happy Elvis Birthday, Kathy! What a great surprise! Thanks for dropping by Jana! This was a fun one — for sure! Fantastic story. Would have loved to be there.